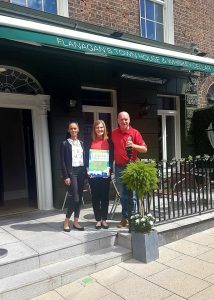 A little earlier than usual this month due to holiday plans, the Limerick City Tidy Towns monthly award for August 2018 has been presented to Flanagan’s Townhouse & Whiskey Cellar at 31 Thomas Street for their beautiful renovation of this historic Georgian building in Limerick city. Pictured outside the premises being presented with the award by Maura are owner Cathal Quinn and Sales and Marketing Manager Natalija Rimpo. A couple of months ago, we got a call from a member of the public recommending Flanagan’s Townhouse as one our monthly award winners and we were only too happy to agree with their choice. It is wonderful to see this beautiful building which is historically well known as part of the hospitality industry in Limerick city restored so sympathetically to its former glory under the new guise of Flanagan’s Townhouse, having maintained the beautiful Georgian exterior features and interior character, and enhanced it to create this contemporary and hugely attractive building, which is a great asset to the hospitality industry in the city. Flanagan’s Townhouse and Whiskey Cellar is a sister restaurant to the well-known Flanagan’s on the Lake in Ballina/Killaloe and opened on Thomas Street in April 2018. It is clear that they have brought all their experience and reputation for excellent food and customer service gained over many years to their new establishment in Limerick City which has quickly established itself as a popular destination for locals and visitors to the city. Their motto is “Great Staff, Great Food, Great People” and their new property perfectly reflects this, both inside and out, not just in its appearance but in the quality of its service and food. For more information or to book a table, visit their website www.flanaganstownhouse.ie or call them on 061 410957. 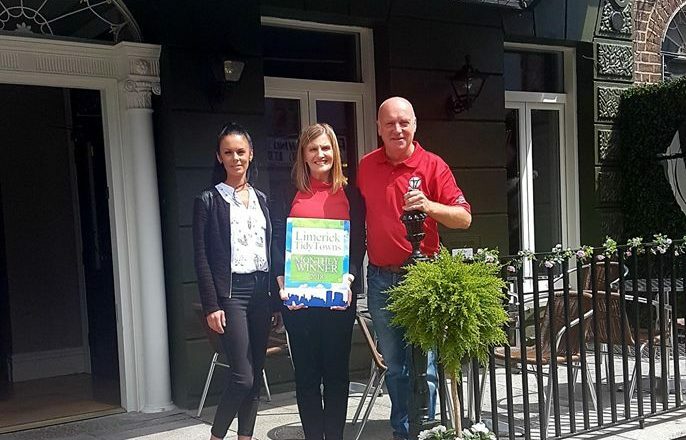 Flanagan’s Townhouse is Limerick City Tidy Towns’ eighth monthly winner for 2018, following St Michael’s Rowing Club in January, Foot Solutions in February, La Fromagerie in March, Portleys Bar in April. Be Your True Self in May, Jack Mondays Coffee House in June, and the Limerick City Council Parks Department in July, and they will be in with the chance of winning this year’s overall prize at the Tidy Towns Group’s annual event to be held early in 2019.